No longer worry about fussing with switches or even a smartphone to control your automated systems. You can stop digging through apps and remote controls to turn on lighting, AV, music and more. Now with help from Gramophone and the Amazon Echo, you can control your home with merely a sentence. 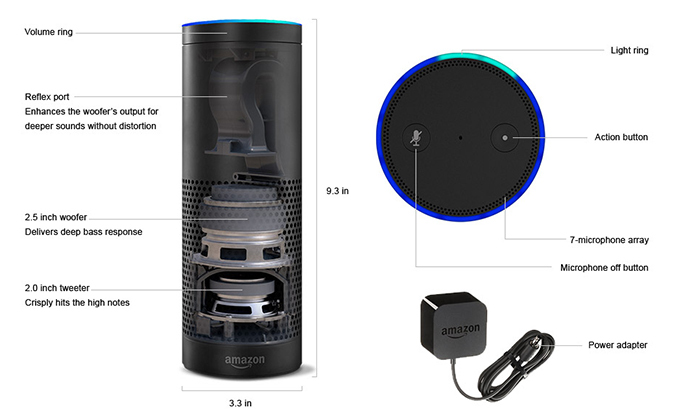 From outdoor lighting and sprinklers to security and HVAC, Amazon Echo and help from its personality Alexa can instruct any system in your household with just a vocal command. We're bringing voice control technology to our showrooms, so you can experience how it can revolutionize your own home and lifestyle. Contact us today for more information. Voice control is not just a modern convenience for the tech-interested consumer, but for those with disabilities and medical impairments that could detract from the ease of remotes, switches, and smart device control of one's home. With voice control, all physical connections between you and the operations of your home are no longer necessary: Merely speak, and your wishes are voice control's command. Amazon Echo comes ready to connect to your Wi-Fi. The Alexa App is compatible with Fire OS, Android, and iOS devices and also accessible via your web browser.